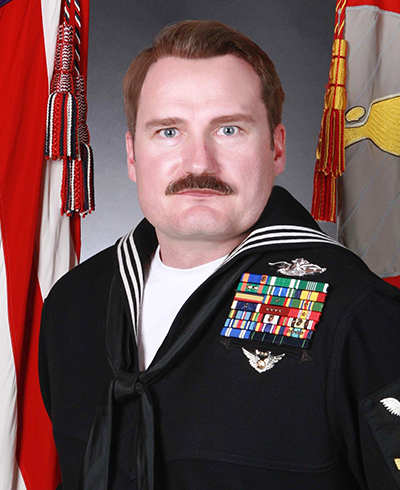 Born in Phoenix, AZ, a native of Colorado Springs, CO, and a 1994 graduate of Mitchell High School, Hospital Corpsman 1st Class Darrel Enos enlisted in the Navy in January 1995. He began his career as a Corpsman, attending Basic Hospital Corpsman School in San Diego. HM1 Enos reported to MARSOC in July 2007, first with the Marine Special Operations Advisor Group, then to 2nd MSOB and finally 3rd MSOB, completing three deployments with MARSOC. HM1 Enos deployed in support of both Operations Iraqi Freedom and Enduring Freedom. While assigned to Team 8313, HM1 Enos was preparing for an Afghan Local Police inauguration ceremony near Kanesk, when an ALP recruit opened fire on the team, killing him and another team member. HM1 Enos’ personal decorations include the Purple Heart, Air Medal with two Strike Flights, Navy-Marine Corps Commendation Medal, Army Commendation Medal, three Navy-Marine Corps Achievement Medals, Army Achievement Medal, the Combat Action Ribbon and four Good Conduct Medals.